DTI National Exporter’s Week “Usapang Exports” Dec 9, 2016 from L to R: Andrey Sapozhnikov, Trade Counsellor, Russian Embassy, Manila; Itamar Gero, President, ICCP; H.E. Julio Camarena Villaseñor, Ambassador of Mexico to the Philippines; Hadass Nisan, Deputy Chief of Mission, Embassy of Israel in the Philippines; N. Ramakrishnan, First Secretary, Embassy of India; Agnes Perpetua Legaspi, Assistant Director, Export Marketing Bureau, DTI and Senen Perlada, Director IV, Export Marketing Bureau, DTI. 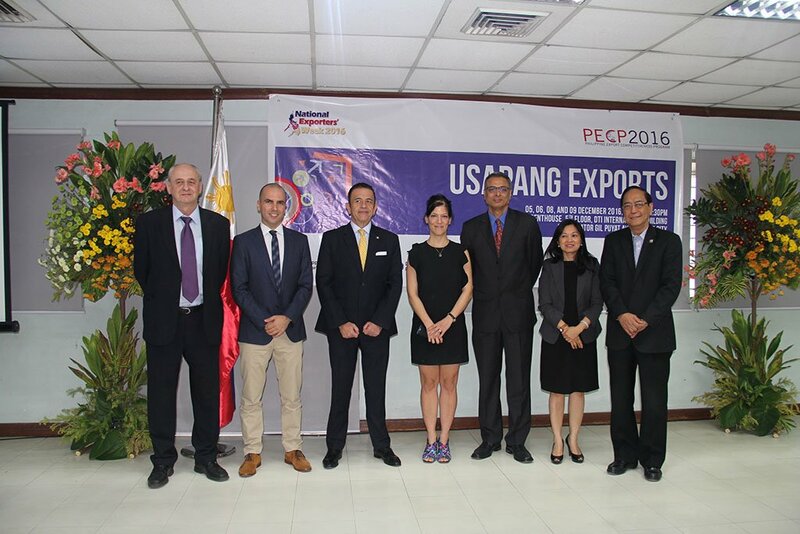 Israel Chamber of Commerce of the Philippines (ICCP) President Itamar Gero last week invited potential investors to expand their export businesses in the Israeli market, in a seminar called “Doing Business with Israel” last December 9 during Exporters Week. The Department of Trade and Industry (DTI), together with the Export Development Council and the Philippine Exporters Confederation, Inc., organized the series of seminars entitled “Philippine Export Competitive Program.” Representatives from the Manila embassies of Israel, Russia, Mexico, South Africa, and India gave their own remarks on trade and export viability within their respective countries. The ICCP has always encouraged business-to-business networking and bilateral trade between Israel and the Philippines. Mr. Gero talked highly of the “strong affinity and bond” of the two countries as they celebrate the 60th anniversary of their diplomatic relations. The ICCP president presented Israel as a very viable country for export businesses, given its advanced economic growth rate, high life expectancy, excellent macroeconomics, first-rate medical technology, outstanding tourism, and the best expenditure on research development in the world. The trade relationship between Israel and the Philippines continues to grow with Philippine imports from Israel having experienced a sharp increase by 68.16% from 2014 to 2015. Over 30,000 Filipinos still live and work in Israel today. The Embassy of Israel collaborates with the ICCP in strengthening the economic partnership between Israel and the Philippines, promising to lend a hand to local businesses that are eager to join the Israeli market.